Is anyone going to see the (old) Tappan Zee Bridge being exploded on January 12 at 9:30 AM? Remember to take photos! If a weather system hits the area this Saturday as predicted; such might be postponed. Postponed, no new date set as of yet. Update: Tuesday Jan. 15 is now the rescheduled date; however, the time has not yet been determined. I have never heard of this junction (never been to LI), but judging by the aerial photos, it looks like a mess with that double merge. It is interesting to see that all options are on the table in those cutaways. I doubt 75% of them will be considered. It's a total disaster that NYSDOT knows they could've avoided, but they wanted to build it in a way that didn't piss off the environmental lobby. Plan V-3 is the best of them, but even that needs some modifications. One of which is to have the west end of Montauk Highway and the entrance to Connetquot River State Park in an intersection with the service roads. The other is to reduce the number of on and off ramps between Connetquot Avenue and Locust Avenue. NY 27A/Connetquot River State Park and Suffolk CR 85 should strictly be Exit 47. There should be no Exit 46A, no Exit 47A, and no unnumbered exits to minor roads and local businesses. And all the button copy remaining at the I-684, I-84 JCT has now been replaced. So this is gone. 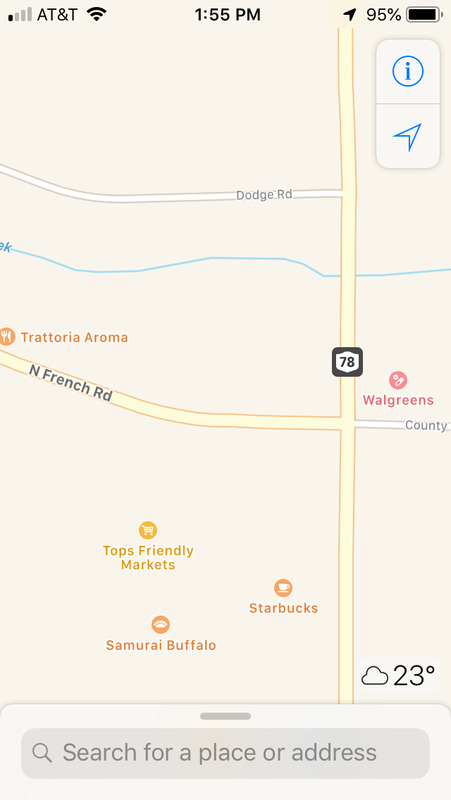 One thing that has always amazed me is that 3 unique "French Roads" intersect with Transit Road (NY 78) in Erie County. 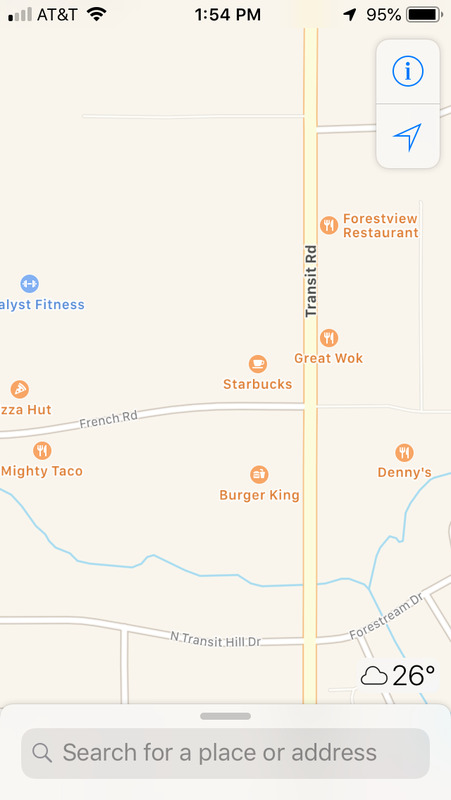 There's French Road in Depew, French Road in Cheektowaga, and North French Road in Amherst. Awesome video! Even a cast iron marker for New Boston on NY 177! So that's why they call them snow plow "riders"! I never realized this sign was that old going back to the non-reflective days. Yesterday, one of my friends posted this video of a mast arm in Oswego bouncing in the wind. Based on the fact that the signal head is 3 feet tall, I'd say the end of the mast arm is moving at least 6 feet. I'm surprised it didn't break off! A few days ago, I also saw this video of a set of lights falling off a span wire in Williamsville. Apparently $100k has been put towards a design competition for a Buffalo Skyway replacement. I have no idea what this would entail or how they will pull it off. Are they really going to funnel all of these cars onto Main Street with a drawbridge? Perhaps. The Buffalo River just doesn't see that much traffic anymore, with most of the mills long abandoned. (Is there such a page to view the number of openings of a bridge per year?) And I suspect the bridge will still be elevated to allow for pleasure craft to still move about without having to open the drawbridge for most instances. Ah, yes, replace the deck and perform major maintenance, then announce a replacement a few months later. This is political more than anything. If it was intended to be more of a band-aid fix, they'd have used modular deck panels that could be used elsewhere like was done with Tappan Zee. As far as river traffic, anything they put in will have to accommodate barges serving General Mills and the crapton of sailboats calling the former ship canal home. Furthermore, the marina and General Mills property extend under the Skyway, which currently sees 42K vehicles/day (busier than NY 198, which had a diet forced through as well). Pre-Skyway, NY 5 used Michigan Avenue to cross the river. I want to say that part of the former alignment (west of Ganson St) was taken over by General Mills and the Ship Canal bridge was removed in the 60s. Furthermore, there are a ton of freight/rail movements in that area which would frequently tie up traffic. I get wanting to remove the elevated highway, but those 42K cars need to go somewhere. As a daily user of this bridge, literally at all times of the day, I don't see removal as a possibility. I also don't think putting the traffic into surface streets is necessarily the right way to go. Maybe a tunnel of some $ort is the option, or shifting everything to the east. If you ask the amateurs at Reddit in r/buffalo, they seem to believe the only reason to remove it would be to implement Buffalo's version of the High Line. That's incredibly short slighted and silly. This project would result in needing to rebuild exit 7 of I-190 southbound. 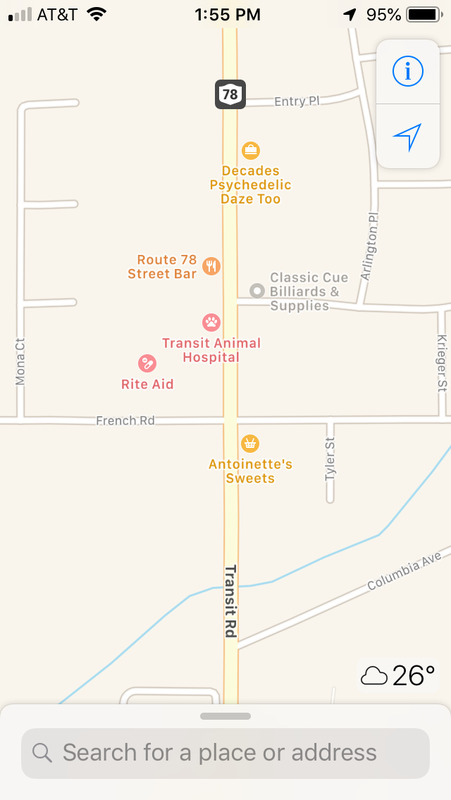 If they wanted to go with an arterial boulevard with a drawbridge in the middle, I get it, but I don't think it will work as well as one would think. My proposal of a new boulevard would include a NFTA extension of the Metro, but the problem is that it won't get us anywhere. Also, any new proposal should involve upgrading 5 through Woodlawn, resulting in the 40 mph speed limit going away. The height for trucks and buses is already there, so I don't need to ask about that one. Regarding the first bridge, I would say email the MTA as it is maintained by them. I used to drive under that bridge daily, amazing how high it is. Looks about 27'-31' tall based on the roadway lane. When did NY start using reflective button copy? I saw old sign plans from 1979 or so showing a reflective button copy exit tab to be added on top of non-reflective button copy signs on the BRP. CT phased it in around 1984 or so. NYS has used button copy since at least the original signs on the Thruway. I know button copy was phased out sometime between 1989 and 1992. Button copy signs were installed in 89 in the Utica area, but in 92 it was all reflective sheeting in the Syracuse area. The first button-copy I ever saw on Long Island (Region-10) was in the early 1960's on the L.I. Expwy when it was built as far east as Route 110 in Suffolk County. ..............The last button-copy sign project here was in 1984 when the entire length of Northern State Pkwy. in Nassau & Suffolk Counties was completely re-signed. And many of those have been replaced by now. New sign projects done on other Long Island Parkways in the late 1980's did not use button-copy.